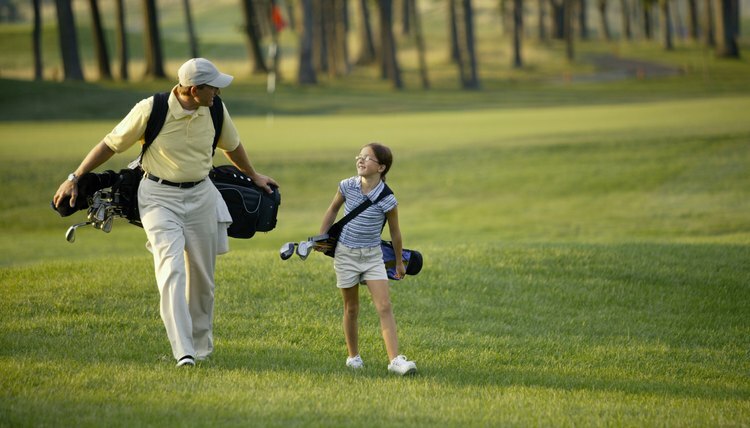 Handicaps level the playing field among golfers of all abilities. Handicaps are designed so players can play against each other fairly. Golfers with a zero handicap are called "scratch players." This means, on average, they will shoot par. Your handicap indicates your potential playing ability, not your average score. If a player with a 10 handicap played against a player whose handicap was a 2, then the first player would be granted 8 strokes when calculating final scores in what is called "match play" rules. Your handicap will change as your game improves. Go to a free online calculator and enter in the par numbers for the courses or the standard scratch scores. The standard scratch score may be different than the par for that course. The standard scratch score, or SSS, considers how challenging a course is compared with others having the same par. Enter in your scores for each round of 18 holes you played next to the SSS for the course. Adjust your scores if the calculators will only accept a maximum score of 2 over par. This is to determine an accurate handicap to reflect your playing ability regardless if you performed poorly on one hole. Hit "calculate" to get your initial handicap calculation. This is usually based on only a few games. Add new scores every time you play a round and recalculate your handicap. What Is a Good Score for an Average Golfer?